Once again I have fallen behind in posting to this site or my other Portrait site for that matter as well. I took a wildflower photography vacation to the Great Smoky Mountains National Park and then took a family vacation down there as well. Also five straight weekends of weddings in May didn’t help matters as well, so maybe now I can post some of the great images I was able to capture the last couple months !! Stylophorum diphyllum (celandine-poppy, wood poppy, poppywort) is a herbaceous perennial native to moist woodland in eastern North America, valued for its yellow flowers. The common name is derived from greater celandine (Chelidonium majus), a closely related European plant with similarly shaped leaves and similarly coloured and shaped flowers. Plants grow about 1.5 feet tall from rhizomes. Leaves are pinnately cut and lobed. They grow from the base and off the flowering stems. Apart from its normal sap, Stylophorum diphyllum produces a yellow-orange latex that stains. 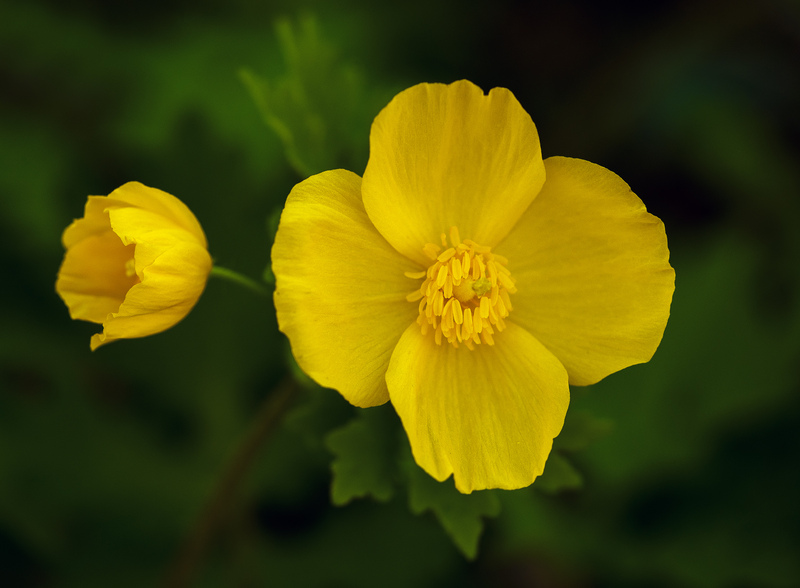 In spring, the deep yellow flowers of the Wood Poppy appear as a brilliant display on the forest floor. It comes as no surprise that the other common names of this plant are “Yellow Poppy” and “Celandine Poppy”. Members of the Poppy Family are characterized by their production of latex, which in the case of the Wood Poppy is yellow. The flowers have 4 yellow petals, two soon falling sepals, many yellow-orange stamens, and a single knobby stigma. They appear in umbels of one or more flowers from early spring to early summer. After fertilization, a bristly blue-green pod hangs below the leaves. Seeds with white elaiosomes ripen in midsummer and the pod opens by four flaps. Plants are relatively long lived and readily self-seed under garden conditions, where they are grown under full to part shade. The Wood Poppy is a beautiful wildflower but they are extremely hard to photograph at times, the bloom is so big it tends to make the plant droop over making it hard to focus on the inside of the bloom. I captured this one right as it bloomed from the bud and hadn’t gotten a chance to fall over. So here is the image and I hope you like it and I also hope you take the opportunity to get out and photograph or just observe the many different variates of wildflowers that grow here in Southern Indiana ad in your neck of the woods as well ! !